On Tuesday, Nov. 27, the Mission Valley Cruisers donated eight winter coats, hats and pairs of gloves to the Pablo Elementary School coat closet program. The program is in place for students that may be in need of a winter coat. Pictured above are MVC club member Dave Gingras, Pablo School special education teacher Hanna Conn, MVC president Ron Millstead and MVC club member John Moon. 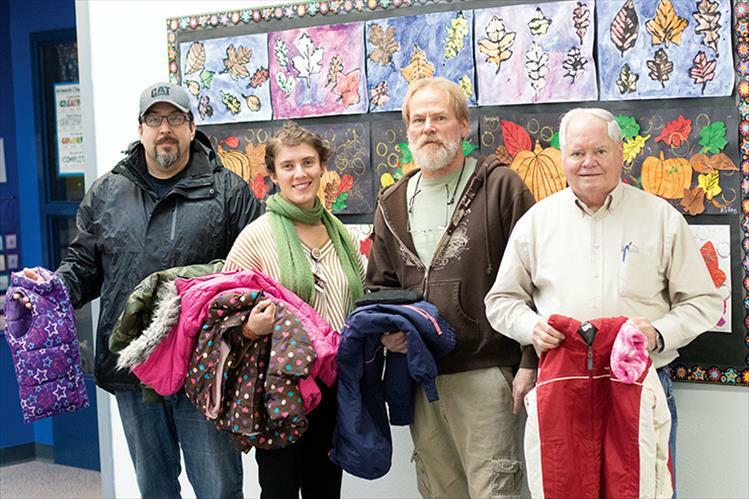 Rob Zolman / Valley Journal On Tuesday, Nov. 27, the Mission Valley Cruisers donated eight winter coats, hats and pairs of gloves to the Pablo Elementary School coat closet program. The program is in place for students that may be in need of a winter coat. Pictured above are MVC club member Dave Gingras, Pablo School special education teacher Hanna Conn, MVC president Ron Millstead and MVC club member John Moon.